A Life’s An Adventure walk is all about the pack free experience where you only have to carry a bottle of water, your camera and a jacket. But to make the experience even better it’s worth training for the walk and that simply means getting outdoors with your daypack on and clocking up the kays in your local area – a park, some nearby bushland, the beach, if you can walk it you’re already training! Think about it, not only are you preparing for a world-class walking experience you’re getting fit at the same time – and if you bring along a walking buddy you’ll be catching up on all the local goss. The Larapinta can be rocky and uneven. 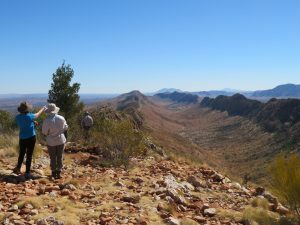 Ok so what to expect on the Larapinta Trail? 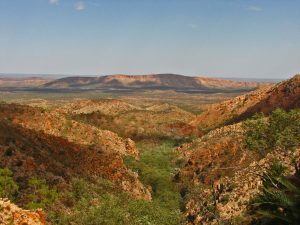 NT’s most famous walk offers a range of geographical features like gorges, long stony trails, mountain peaks and dry creek beds so the terrain can change at any time. Considering this it’s worth throwing in some hills and sand walking – even a bit of rock hopping to prepare for the walk. Your five-day itinerary includes a 16km day to the top of Mount Sonder and back and a 15km day from Eagles Landing to Counts Point, so it would be ideal to reach these types of distances near the end of your training. But don’t worry your Life’s An Adventure guide will go slow and easy – there’s never any rush. 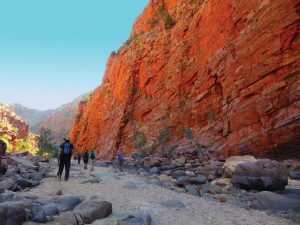 Check out the full Larapinta Trail Pack-Free walk itinerary. The amazing view from Counts Point. If the last time you did any form of physical exercise was when John Howard was Prime Minister then you’ll want to start small and work up. A training program of four to six weeks prior to the walk should get your ready. The first thing to do is go online and research your local area to find parks, walking paths, coastal areas and the like, then make a date for your first walk. You’ll just need some comfy shoes for your training like a pair of runners or if you’re totally old-school a pair of Dunlop Volleys! But you get the picture. We’ll feature a blog on the best footwear for the Larapinta later on. Ok, so you’ve found where you’re going to walk so put a few things on your daypack and get out there. Start with about a 5km flat path making sure you stop to hydrate and rest. That should take you around an hour. Do this two or three times over the course of a week and you’ll begin to feel your body adjusting to your new regime. On week two up the ante by throwing in some hills or walking on the sand barefoot – this is great for building ankle support and aerobic fitness. If you have a Fitbit or some way of recording your distances then that will help. But if not just extend your walks by half an hour per week and you should be on track (no, pun intended). The scene fit for a watercolour. Australia has hundreds of national parks and many are close to major metropolitan cities. They all offer a range of accessible, safe and well marked walking trails so weeks three to six of your training would be well spent walking them. Every state has a National Parks authority with a website offering info on each park, its trails, maps and other info. For info on National Parks in NSW visit nationalparks.nsw.gov.au or Victoria go to parkweb.vic.gov.au. You can Google the rest. You can then locate a local park and you’ll see all the walking options. Pick a walk, access the map and you’re away. By week six if would be ideal to be able to walk 15-16km on varied terrain without it being major effort. Make sure you have plenty of rest and drink stops. If you can do this then you’re ready for the Larapinta Trail because as they say, life’s an adventure.